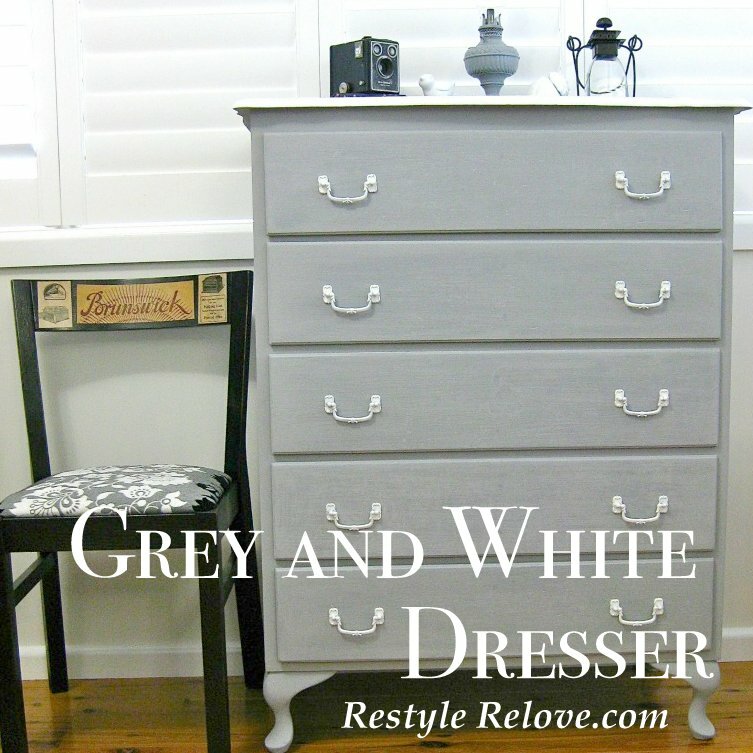 I won't keep you in suspense, here is my finished now Grey & White Dresser! I recently did a post on how I came to "rescue" this dresser from the roadside. You can read the full story here. But in short, I went to a lot of trouble and time to get it in the car. Embarrassing! But I am happy to say it was well worth it! This little or not so little freebie came up so beautifully. I'm not doing a tute on the makeover because it was so basic. In short, I removed all the stickers and gave it a good sand. I didn't intend to distress it so I left the blue paint on. gave it three coats and then sanded it again. off in areas to give an aged look. Then I mixed up some white chalk paint and trimmed the top edges and legs. I plan to give it a coat of clear furniture wax as well. The inside drawers were super clean so I didn't do anything to them. The total cost = Nil. I used left over paint and spray paint. And the whole project only took 2 days to complete! It looks amazing!! 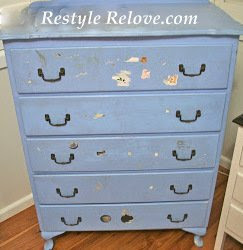 I would LOVE to have that dresser in my house! Great job! Hi Julie, nice make over. Your dresser looks so much better now. Love the color. I love the color and how it seems to have a little "texture" to the front. (Maybe it's just the photo). Love it with the black and white scheme. This piece is so versatile, it could be used in many places. Great job! a great find and a fab redo! love the white edge detail! Looks so classy and refined. I love the gray color. And adding the white around the top is very striking. 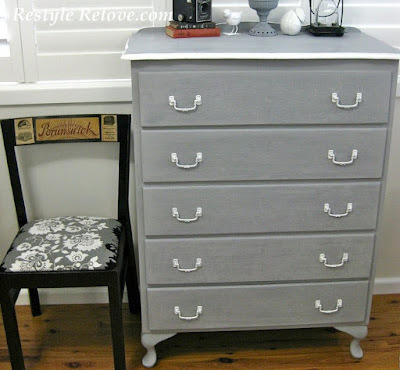 A great find and a great transformation, it is so very pretty now. I also love the gray color and I really like how the white around the top really make sit pop. Very stylish looking! Thanks for sharing your creative inspiration at Sunday's Best Par.tay! What a great look for that poor dresser. Paint is amazing for changing things. Thanks for sharing. Looks Fabulous! Love the color alot!! Thanks for linking up! Visiting from At Home with K.
(Vising from Cowgirl Up linky, btw). 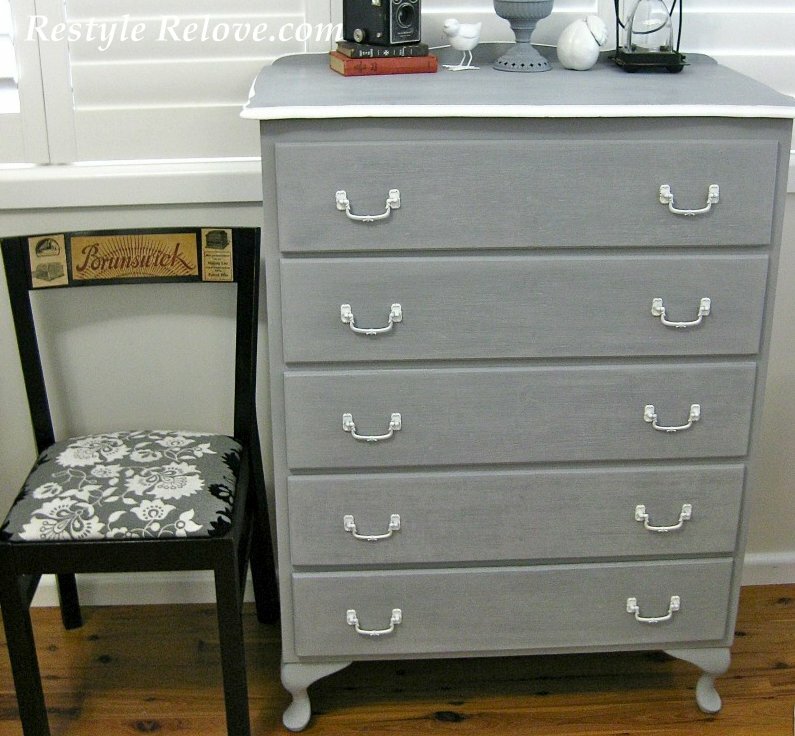 I can't even believe that's the same dresser.. You go girl! Thanks for sharing at Beautify It Monday! We hope we'll see you again next week! That dresser was totally worth embarrassment! You did a wonderful job transforming it. I think you did a great job! I love how you added a few white details, I would not have thought of that! You did get the last laugh! It's is a dramatic makeover! I love the gray and white too. Thanks for sharing it at the Rock N Share! 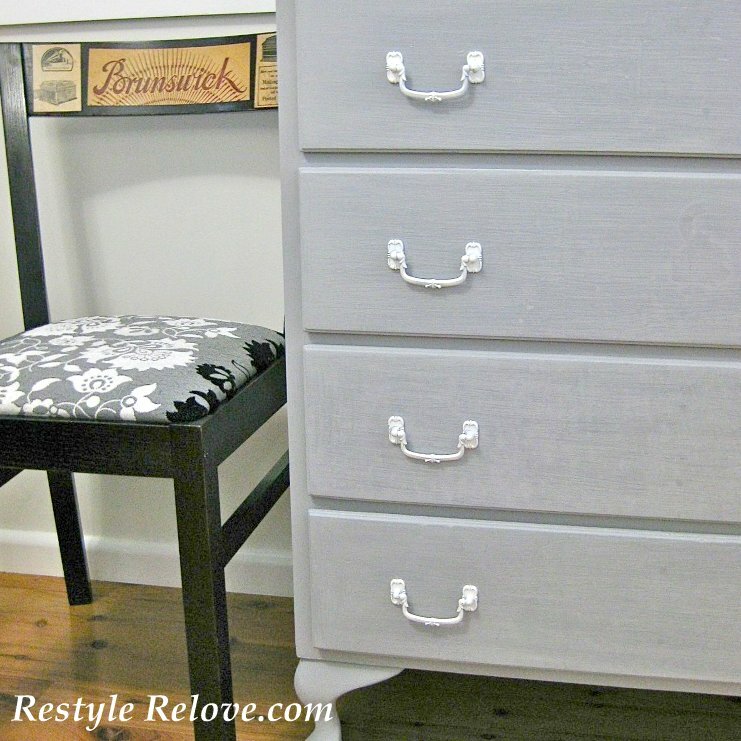 This dresser could not have turned out more perfect. I've already pinned it. Love the white handles. Well done! I'm visiting from Funky Junk and love your blog. I'm following with GFC and Linky. Liked your FB page too! Have a wonderful weekend. Absolutely lovely! The color is wonderful! Thanks for sharing at A Pinteresting Party! You did a great job on your dresser. I love the white trim you did. I found you from Common Ground and I am now following you. Your blog is great. That is a really lovely shade of gray. I really like it with the white accents. YOu did a great job! Thanks for linking up! The chest looks awesome along with the chair next to it! Enjoy your week. What an elegant makeover. From chippy to sophisticated. Wonderful job. I love the grey- you did a great job! oh my lord i love that! love the color, love the legs, love it all! That turned out just beautiful and I love how you did the white accents! 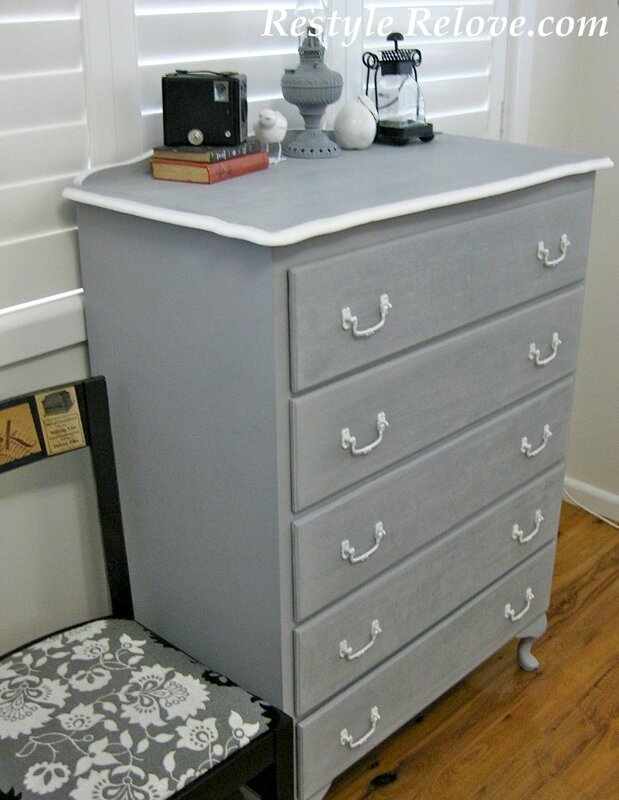 I have a dresser like it too that I bought gray paint for last year maybe after seeing yours and being so inspired I'll get to it! Following you now and found you at Primp! What a makeover, and wonderful color choice! I am a new reader, looking forward to seeing more of your great posts. Thank you! I do like your dresser and you've done a lovely job! 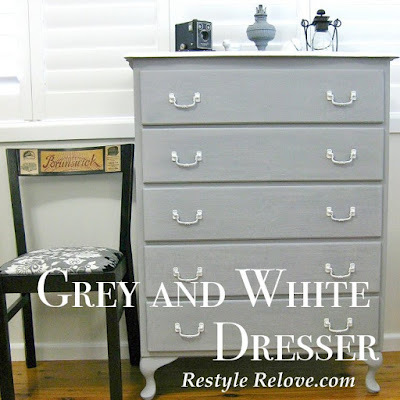 I have this linked to my dressers post too today, well done! 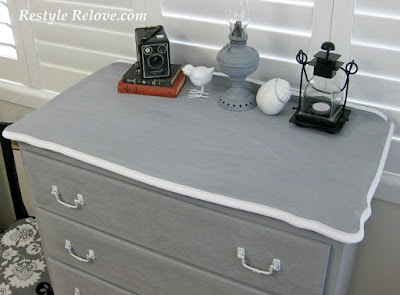 The dresser turned out beautiful and the story of how you got it into your car so funny! What a great find- and free!